This is great, ODB. A real treat. Thankyou so much for sharing these time-pieces. ODB wrote: I now have a digital copy of the Boxing Day Premiere of the Return of the Jedi presented by Thames television (remember them?). What would be the best way of sharing this, on youtube its likely to get pulled for copyright. Dropbox or something? Dropbox would be great. You won`t be pulled out because of copyright. The quality is great, ODB! I just flicked thru Star Wars. Star Wars on 80s ITV is very Starwarsy. Seeing as we're not being all candid about these things, here's the copy of ESB I was sharing via PMs earlier. To recap, it's a rip of an entire Beta 3.5h tape where somebody left it running on Xmas Day 1988 to catch the ESB premier while they were busy. So, it's uninterrupted Christmas Day ITV with Empire - with ads - in the middle. Thanks once again Declan for the ESB upload. I've wanted to track down the ANH premiere for an eternity, so this is an absolute gem. My well-worn Betamax copy went missing in a house move in the mid 80s. Amazing after all these years that I could still anticipate where the ad breaks were. Strange that there were no Palitoy SW adverts. You would have thought they would've been all over this. chipsteak wrote: Here's a pipedream if ever there was. Before I saw a SW film, I had an older brother filling my head with how great it is. We both got crazily excited for a school holiday morning showing of The Making Of Star Wars. This marked my first viewing of moving SW images. An off-air of that - with late 70s continuity - would be as great as it would be unlikely. 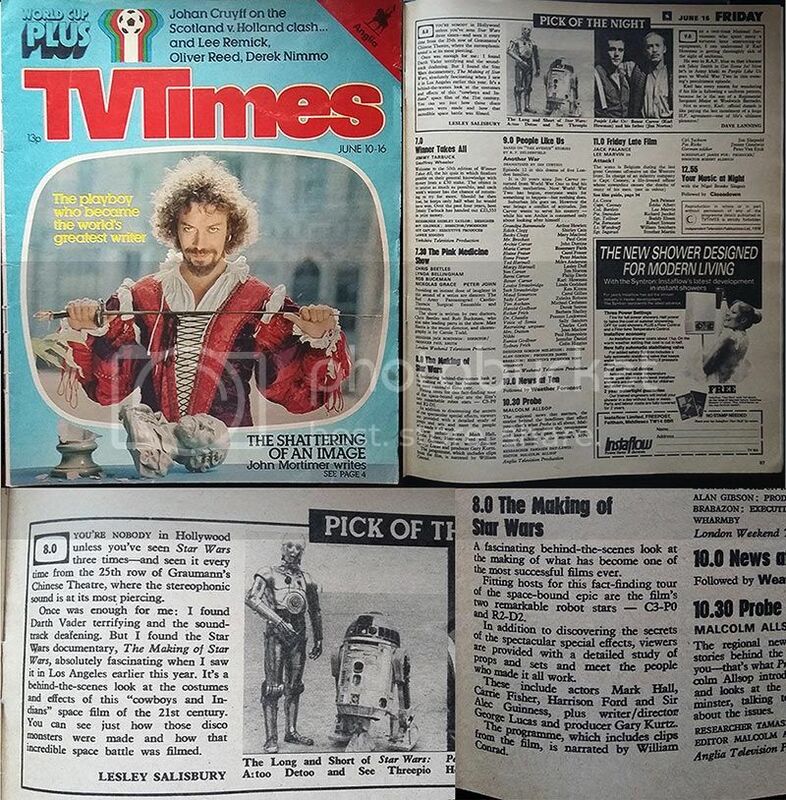 I know it's no substitute for a copy of the actual ITV screening, but here's the TVTimes for June 10-16 1978 that I managed to pick up. 8pm couldn't come fast enough! Wow, just shows how somethings stand the test of time really! Nice find, Twin. I'm referring to the shower advert. Phwaaaaooor. 8pm seems quite late for that sort of thing. My ( slightly later than 1978 ) memories of 'Making Ofs' was of them turning up during the day on school holidays. chipsteak wrote: Nice find, Twin. I'm referring to the shower advert. Phwaaaaooor. I know.....70s babes are absolute filth.....Cwoooooaaaar! (adopts Sid James lecherous smirk). TBH don't remember the school holiday repeats, but the June 78 showing is seared into the memory. I'm glad I'm not the only one who remembers where the ad breaks are! I didn't have a VCR until a bit later. I taped SW from STV on the afternoon of 2nd January 1986. If the ads are in the same places, ill know them well by the slight jumps caused by my advert illimination attempts. A few frames of that quad poster would creep in tho. Any news on rotj odb? I don't think these are going to quite have the same mainstream appeal as torrents or pirate videos and we can easily pull them if any trouble comes of it. Mediafire put up a fight to upload this so I hope it works. And wow. Thanks for these - they're gold. My memory of the ROTJ premiere is that they seem to have done their own scan. Like Empire it was unlike the videotape, but here they did some very odd panning and scanning to get Jabba's subtitles on screen. Boxing Day line-up. I'm actually excited by that! Watched ESB Christmas 1988 a million times. First advert break had the new Ford sierra and Scotch video tape I believe.